This book focuses on families and their changes in Taiwan and China. Traditional notions of what constitutes a family have been changing in China, Taiwan and other Asian countries. 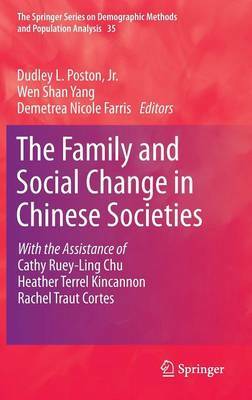 The chapters in this book provide interesting methodological and substantive contributions to the discourse on family and social change in Chinese societies. They also underscore the implications of the various social changes in Chinese families. Written by Chinese and Western scholars, they provide an unprecedented overview of what is known about the effects of social change on Chinese families. One might think that defining a "family" is an easy task because the family is so significant to society and is universal. The family is the first place we learn culture, norms, values, and gender roles. Families exist in all societies throughout the world; but their constitution differs. In the past several decades there have been many changes in the family in Taiwan and China. For instance, whereas in the West, we use a bilineal system of descent in which descent is traced through both the mother's side and the father's side of the family, in many parts of China, descent is patrilineal, although this is changing, and China and Taiwan are starting to assume a family constitution similar to that in the West. This and other issues are discussed in great detail in this book. Indeed it is the very nature of the differences that motivated the writing of this book on changing families in Taiwan and China. The chapters in Part I: The Family in Taiwan and China focus on the basic family issues in Taiwan and China that provide the groundwork for many of the chapters that follow. Chapter 1 is about the distribution of resources in the family in Taiwan. Chapter 2 focuses on filial piety and the autonomous development of adolescents in the Taiwanese family, and Chapter 3 explores the important issue of family poverty in Taiwan. Chapter 4 moves away from Taiwan and looks at several issues of family growth and change in Hong Kong, noting the interesting similarities and differences between Hong Kong and China. Part II: Issues of Marriage, the Family and Fertility in Taiwan and China focuses specifically on marriage, family and fertility. In Chapter 5 the authors discuss the relationships between marital status, socioeconomic status and the subjective well-being among women in Hong Kong and Taiwan. Chapter 6 describes patterns of sexual activity in China and the United States. Chapter 7 considers gender imbalances in Taiwan and their impact on the marriage market. Chapter 8 also focuses on Taiwan and examines the effects of mothers' attitudes on daughters' interaction with their mothers-in-law. Chapter 9 compares female and male fertility trends and changes in Taiwan. Part III: Children and the Family in East Asia and in Western Countries consists of comparative studies of the family and children. Chapter 10 examines the dynamics of grandparents caring for children in China. Chapter 11 explores family values and parent-child interaction in Taiwan. Chapter 12 examines the significant amount of diversity among families in contemporary Taiwan. Chapter 13 describes adolescent development in Taiwan. Chapter 14 examines the impact of son preference on fertility in China, South Korea and the United States. And Chapter 15 explores the determinants of intergenerational support in Taiwan. The final chapter in our book, the only chapter in Part IV: The Family and the Future in Taiwan, examines the future of the family in Taiwan with respect especially to the marriage market and aged dependency.